Backers of energy-related ballot measures faced defeat on nearly every front in the West on Tuesday as voters in Arizona, Nevada and Washington rejected a series of proposals that became the subject of costly campaigns. The lone exception: Nevadans overwhelmingly approved an ambitious clean energy standard that still faces a second hurdle two years from now. In Arizona, voters overwhelmingly rejected Proposition 127, a measure that would have required the state’s power providers to generate at least half their annual sales of electricity from renewable resources by 2030. The measure was defeated roughly 70% to 30%, according to results posted on the Arizona Secretary of State’s website. The race became a high-priced battle between competing interests. California billionaire Tom Steyer, whose environmental advocacy group NextGen America backed the proposal, and Arizona utilities, including Arizona Public Service (APS), spent more than $50 million in the fight. Proponents argued Arizona should rely more on solar. “Arizona is America’s sunniest state, but only 6% of our energy comes from solar power. Prop. 127 takes advantage of our state’s unique potential to generate nearly unlimited, cheap, clean energy,” Alejandra Gomez, co-chair of Clean Energy for Healthy Arizona wrote in support of the measure. The measure’s supporters said Arizona Public Service, the state’s largest utility, had wielded money and political influence for too long to maintain the status quo. In response to the measure’s failure, Prop. 127 campaign chairman Eric Hyers said that “the biggest thing we wanted in the cycle we already got, which is doing significant damage to APS’ stranglehold on our politics,” The Arizona Republic reported. Opponents said Steyer was trying to impose California’s energy standards on Arizonans, with the potential to greatly increase their utility bills. California recently adopted legislation, SB 100, that requires the state to get 60 percent of its energy from renewables by 2030 and to use 100% zero-carbon electricity by 2045. APS’ parent company Pinnacle West Capital fought Prop. 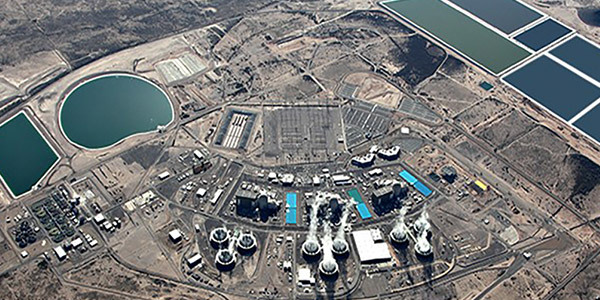 127, saying it could lead to the shutdown of the nation’s largest nuclear power plant, the Palo Verde Nuclear Generating Station, which sits in the desert about 45 miles west of downtown Phoenix. “Lest anyone think I exaggerate, a similar situation in California energy markets contributed to the recently announced closing of California’s Diablo Canyon nuclear plant,” the state’s last nuclear generating facility, Brandt wrote. Southern California draws a significant portion of its energy from the Palo Verde plant in Arizona. Nevada voters went the opposite direction from their Arizona neighbors by approving new renewable energy mandates in the form of Question 6 by a vote of about 59% to 41%, the Nevada Secretary of State’s office reported. The measure, also backed by Steyer and NextGen, would amend the state constitution to require utilities that sell electricity to retail customers in Nevada to source at least 50% of their energy from renewables by 2030. Opponents insisted it would raise rates. With regard to another ballot measure, Question 3, the state’s voters allowed NV Energy to keep its electricity monopoly in the state by 67% to 33% of votes counted. The measure would have required the state legislature to provide for the “establishment of an open, competitive retail electric energy market that prohibits the granting of monopolies and exclusive franchises for the generation of electricity.” It would have allowed customers to exit NV Energy and obtain electricity from others without paying an exit fee. Question 3 was approved by 72% of voters in 2016, when NV Energy didn’t contribute. But this time around the utility, owned by billionaire Warren Buffett, reportedly spent $63 million to defeat the measure, while supporters doled out $21 million. That made it the most expensive ballot measure in state history with a combined $100 million in contributions over two election cycles. Washington voters solidly defeated a ballot initiative that would have placed a fee on the state’s carbon emissions, with collected revenues used to fund environmental programs. I-1631 went down with 56% voting “no,” despite polls leading up to the election showing about 50% of potential voters favoring the measure and about 36% opposed. Unlike a proposed “revenue-neutral” carbon tax (I-732) that failed to win passage in 2016, I-1631 was not designed to return its revenues back to residents. Instead, the monies raised by the fee would’ve been allocated to state-directed investments in “clean air and clean energy” (70%), “clean water and healthy forests” (25%) and rural communities heavily affected by climate change (5%). The measure sought to charge energy producers and suppliers a $15/ton fee on CO2 emissions starting in 2020, rising $2/ton each year (plus inflation) until 2035, when the price would have hit an estimated $55/ton. While manufacturers were not to be directly subject to the fee, they would have paid indirectly through higher fuel costs. The bill was broadly supported by groups and companies as diverse as the Sierra Club, Microsoft, Union of Concerned Scientists, the American Federation of State, County and Municipal Employees, the Service Employees International Union and several tribes in the state. Gov. Jay Inslee also backed the bill. But opponents spent a state record $31 million to defeat the measure. The “NO on 1631” campaign was spearheaded by the Western States Petroleum Association and its top five contributors, including BP America, Phillips 66, Marathon Oil, American Fuel and Petrochemical Manufacturers, and Valero Energy. The editorial boards of most of the state’s newspapers also urged readers to vote against the measure. Investor-owned utilities in Washington largely stayed on the sidelines, only expressing opposition on grounds the carbon fee would raise electricity rates. “Our coalition is tremendously grateful that an overwhelming majority of Washington voters looked at the facts about Initiative 1631 and overwhelmingly rejected this poorly written, costly and unfair measure,” said a message on the “No on 1631” group’s website. “Unfortunately, the big oil companies, many of whom claim they support carbon pricing as a climate solution, spent about $30 million to defeat this initiative, arguing cynically that the initiative did not go far enough. This hypocrisy needs to be strongly called out,” Kimmell said. FERC denied Berkshire Hathaway Energy’s request to rehear a ruling prohibiting the company’s subsidiaries from selling electricity at market-based rates in four neighboring balancing authority areas in the West.